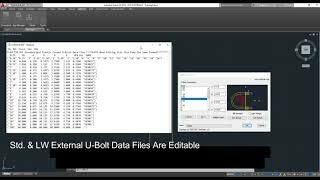 The U-Bolts plugin for Autodesk® AutoCAD® helps you create U-Bolts, Standard and Light Weight around pipes of various sizes. Select from a list of U-Bolt sizes starting at 1/2" through 36" which can be modified by the user adding or removing sizes as required. After selecting the size you can modify the different parameters for the U-bolt. A material thickness is specified at placement time. Select two points for the material thickness and rotation angle and the U-Bolt is added.